Happy Spring! the long winter is gone and it is time to sprout, inside, outside and in my studio. Today is also Mother's Day, what a special day to tell you about my new creation. Oh yes, I can finally tell you all about it. I've working on this for months, I still amazes me how I could fit such big pieces in my old tiny studio, I remember I could barely walk around it. Since we got a land by a beautiful lake and my husband is a builder himself we decided to jump on it and build our dream house, imagine all the stress and excitement involved. My mission was to pick colors, styles, designs and all should merge his and mine taste. 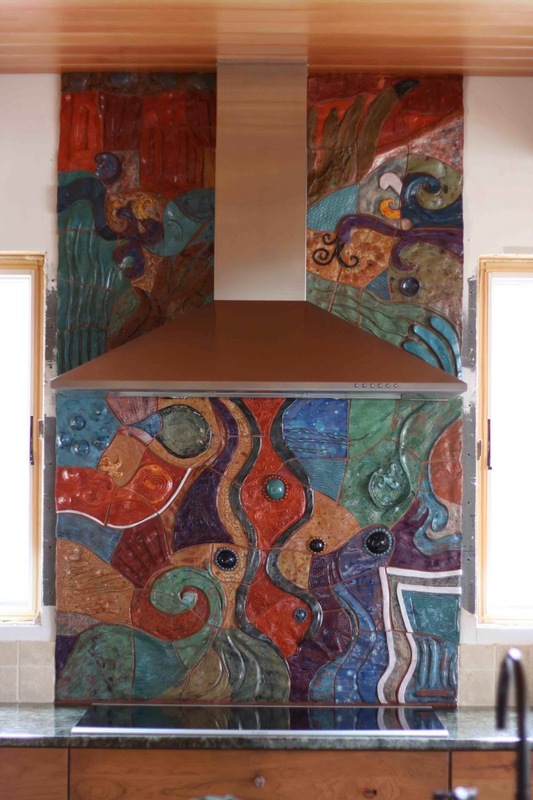 When the kitchen backsplash came to the conversation I said to myself, I should make it, after all, many years ago I used to make permanent wall pieces for business and homes in Venezuela. The adventure started there, he agreed to let me do whatever I wanted since is my kitchen anyways, I love cooking and when I talked to the designer I made sure I had the most confortable place to cook with the minimal cleaning since I dislike cleaning. Look at him, it is the centerpiece of the kitchen, people come over and are amazed to see it, I purposely asked to have the sink in the island instead the wall since I wouldn't have space for a majestic backsplash I had in mind. I fell back in love with working in large scale, my inspiration came from the lake and the woods we have around the property, it is so relaxing here, it is like living in a permanent vacation. Would you like to come over? you can contact me thought my website and I'll glad to give you a tour, my studio is in the basement. Let me know if I can do something for you, either if you are remodeling or building I will be glad to give you a quote for your project, no matter if you are in the area or not. Working large is what I like to do but don't be sad I will still have small work for art shows year around.